WAS STOCKED the WEEK of 8/14/16, and will be stocked again 9/11/2016! Lake is at 39% capacity. Boat inspections are required here! 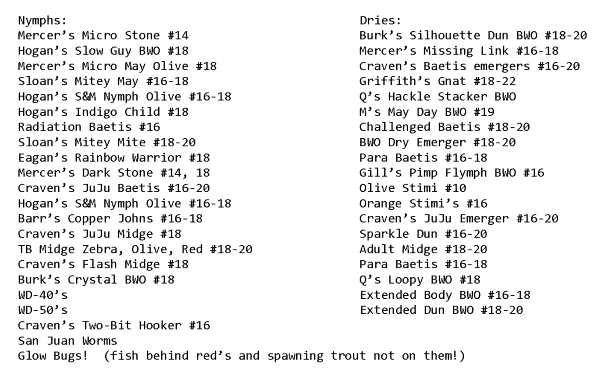 This lake received a much needed stocking of Rainbow trout a couple of weeks ago, small as they are one might target the 18+ inch mackinaw that have come in close to feed on these guys. 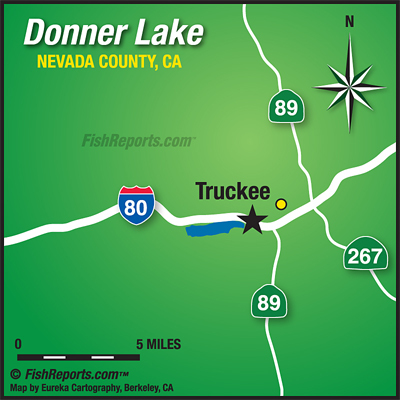 Look around the outlet of Donner Creek, this is where some of the rainbows have schooled up (hint). Some Big Macks being caught recently and those fish have been taken on light Kokanee tackle! When this happens you know they're looking for food and this are getting tough! Throw everything you have at the trout now, ie: powerbait, nightcrawlers, and salmon eggs and combinations of these baits, spoons and spinners of different varieties. By casting closer and then working your way out a little further one can detect what depth the trout are cruising and having patience is key to success now. Kokes are done and spawned out for the season but the Macks will start to pair up and spawn going into November. Get a guide for this lake and learn the ropes! Guides listed on bottom of this page and all are highly recommended! This lake was last stocked the week of 4/24/16, 7/3/2016, 8/14.